Vanna's Choice yarn in 4 colors. I used Mustard (9 skeins), Rust (4 skeins), Toffee (2 skeins) and Brick (1 skein). 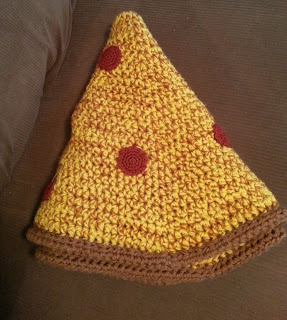 The cheese and sauce part of the blanket is crocheted with 3 strands of yarn held together. 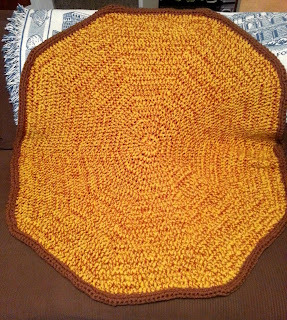 I find it a lot easier when working with multiple strands to find the center pull of a skein. You could also wind your skein into a cake to get a center pull. This seems to prevent the yarn from rolling all over the place and creating a tangled mess. Round 1: Using N/P 10.0mm hook with 2 strands of mustard and 1 strand of rust , ch. 2 and work 10 hdc into a magic ring. 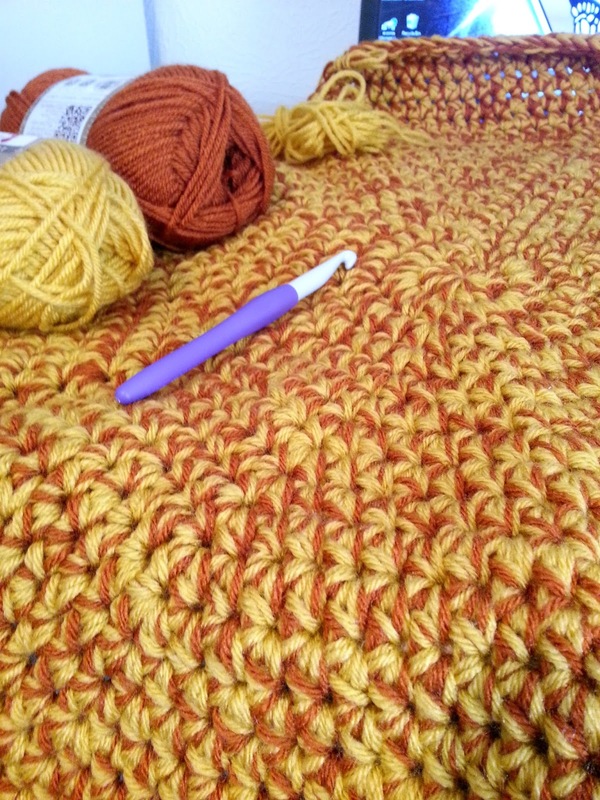 Join with a slip stitch to the top of your first hdc. Hopefully you are starting to see a pattern by now for increasing each round. Continue to increase each round following the pattern until you have a total of 28 rounds. Fasten off after the last round. Join 2 strands of toffee to any stitch along the last round. Fold the crust up towards you and the front of your work. Using a tapestry needle and a long strand of rust, sew the edge of the crust to the base of the first round of the crust. I used one massively long strand of rust to sew the crust, but in retrospect, it would probably be easier to use shorter strands because it started to tangle the further along I sewed. 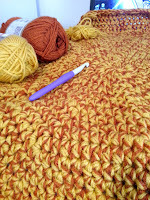 After the last round, fasten off the yarn and leave a long tail for sewing to the blanket. You can make as many pieces of pepperoni as desired. My blanket has 20 pieces. Is the a link to buy the yarn? Supposedly, Michael's carries this brand. I haven't gone shopping for it yet, so, not really sure! Hope this helps. Hi! Both Michaels and Joanns carry this yarn brand, but any worsted weight yarn in similar colors would work as well. 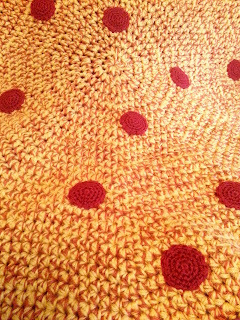 I haven't crocheted in decades and never by written instruction (only instructed by grandmother!). I'm using google and YouTube to try to understand it all. One question so far: For the crust, are you describing folding it over and doubling it up? Like to make a rounded, raised edge (Haha! Like on a real pizza!)??? A close-up picture would be so helpful. Thanks. 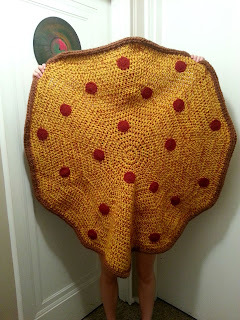 This blanket idea is delicious! Hi! Yes, nfolding the crust over to double it up is what you would be doing.